Be Part of the European Cycling Challenge! Put Dublin on the European Cycling Map! This is a chance to play your part in putting Dublin on the European cycling map! The European Cycling Challenge – (#ecc2016eu) wants to get cyclists throughout European cities to record their daily cycles over the full month of May. The City with the greatest kilometrage(!) wins. Check out http://www.cyclingchallenge.eu/ for more details. We want Dublin to be up there with the best!! 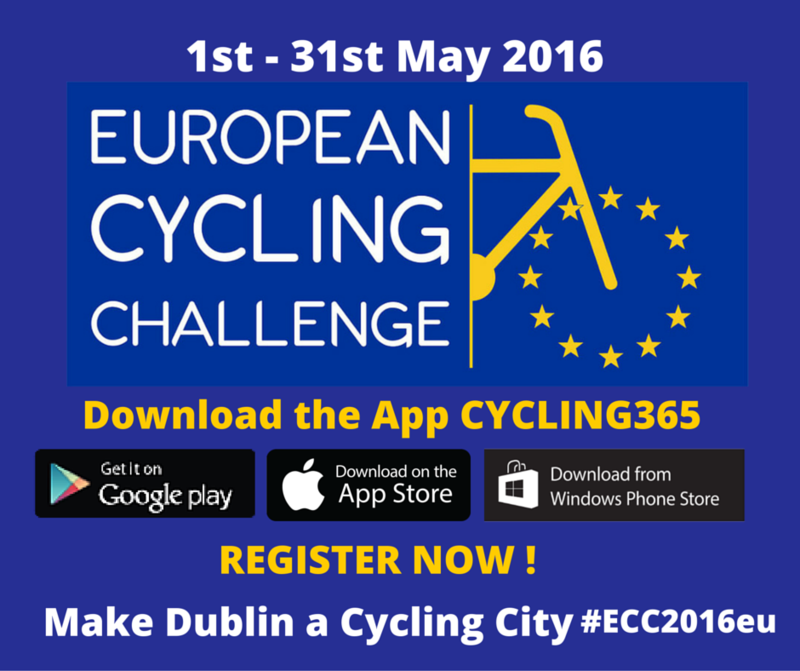 It is really easy to sign up to this FREE city team competition – the European Cycling Challenge – (#ecc2016eu). To register simply download the free App Cycling365 to your smartphone and join the Dublin or Limerick teams. The app will also track your bike journeys during the challenge, which will help you to see exactly how you are performing on your bike!. You can also register on www.cyclingchallenge.eu. The European Cycle Challenge was launched in 2012 by the University of Bologna and every year since has encouraged cyclists throughout Europe to register their trips throughout the month of May. The Dublin’s entry to the Challenge is supported by Dublin City Council, Dun Laoghaire Rathdown County Council, South Dublin County Council, Fingal County Council and the Dublin Cycling Campaign.